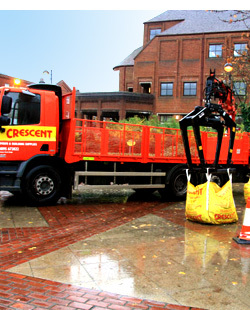 At Crescent we are conscious of our responsibility to reduce and manage effectively the waste packaging we receive from our suppliers and any we pass on to our customers. The Jumbo Bags we supply aggregates in are collected from site when used and are sent to our Uxbridge depot where they are compressed and banded ready for recycling. Cardboard and Polythene sheet packaging is also sent to our Uxbridge depot, compacted and banded for recycling. Even small changes can help the environment. Some of these changes are hardly noticeable, we changed the light bulbs in all our buildings on each site to energy saving. A difference will be seen in the amount of electricity used, saving money, saving the environment. Because we have been getting more and more enquiries into energy saving devices and constructions, we have undertaken a project of training our staff about the various products on the market so that they can offer informed and valuable advice. We are also working with our suppliers in an effort to offer our customers the best possible products with the most cost effective solution.